"Where good food and people meet"
Tucked in Jalan Kayu somewhere in the northeastern part of the little red dot, perhaps unfamiliar to many, is a chill-out spot with nett prices for all its food and drinks. It's located a short walking distance from Thanggam LRT Station. 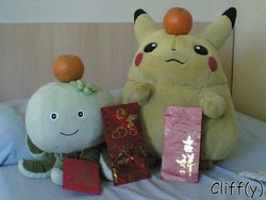 I went there with my BFF and Honeydew for a quiet dinner. It took us a while to decide on which appetiser to get. 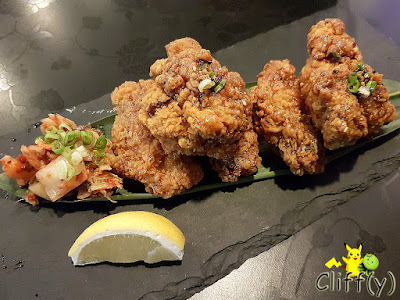 We certainly didn't regret our eventual choice of deep-fried chicken wings topped with a kind of sweet sauce and spring onions, which were balanced in flavours by the dash of lemon. The accompanying kimchi (Korean dish made of fermented cabbages) was refreshing. The chicken main course was delectable as the boneless white meat was succulent. 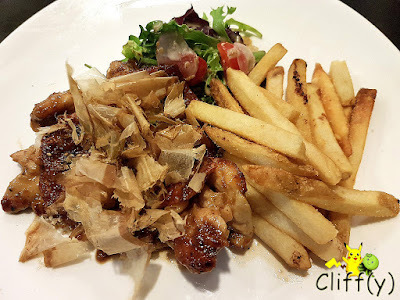 It was glazed with sweet sauce typically used for grilled eel, which I thought could be slightly sweeter, before being topped with katsuobushi (Japanese dried bonito flakes). Tagging along were a bit of salad and lightly salted fries. As one of the star dishes of the restaurant, the fusion pasta dish lived up to my expectations. The thin, fine pasta was al dente, thoroughly mixed with sweet and savoury chili crab sauce. 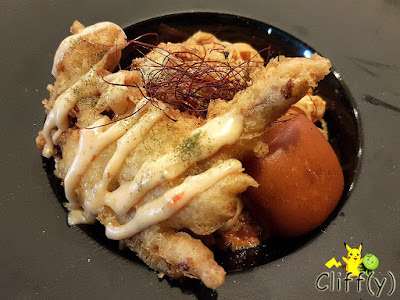 It came with a huge deep-fried soft-shell crab, which batter could be slightly thinner, and fried mantou (Chinese bun). I didn't particularly fancy the cocktail that my BFF randomly chose for himself. 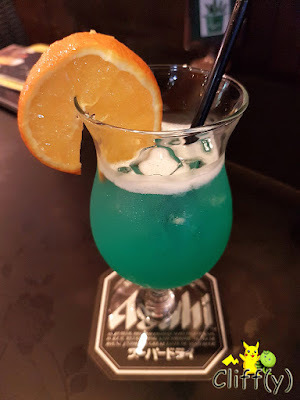 The highball comprising Blue Curaçao, coconut rum and pineapple juice wasn't as refreshing as I thought it'd be, but it had the right level of sweetness. It was quite an enjoyable dinner with not-so-loud songs played in the background. 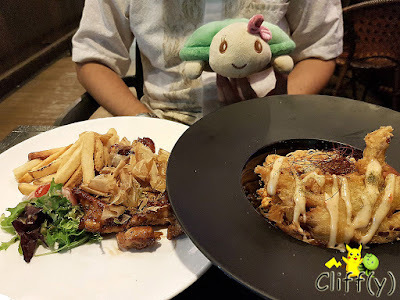 Pika's advice: You may want to try their signature One Place Martini, which is priced at S$14.00. Perhaps it's better than the Blue Hawaiian.